What do you get when you mix chocolate with baklava? a heavenly experience unlike any other that will surely awaken all your taste buds. It is the first and most authentic type of Mediterranean sweets. It embraces hundreds of years of passion into each single piece. The finest nuts are roasted to perfection and sandwiched between fine layers of our grandfather’s secret recipe of phyllo dough and baked with care and affection. Wheat flour, pistachios, cashews, walnuts, sugar, flour, ghee, corn oil, salt. 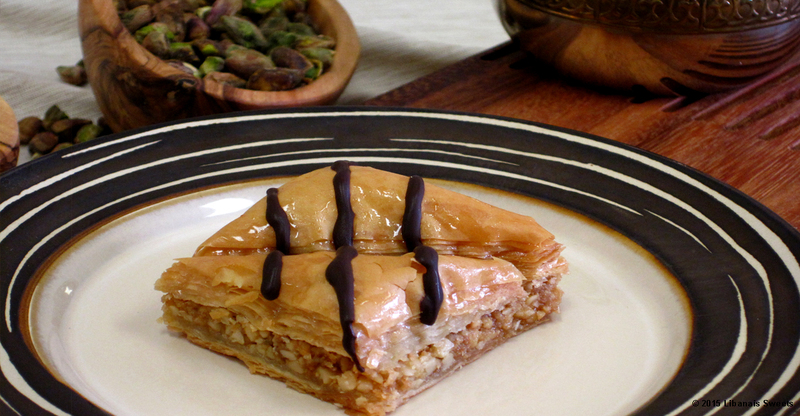 Original Baklava is the most popular among all Mediterranean sweets. It features a thick layer of nuts such as pistachios, cashews, or walnuts. The thicker its nuts filling, the richer and the tastier it is. One of its secrets is the amount of sugar syrup to add to it. The right amount will give it a sweet taste while keeping the taste of nuts and dough in perspective. Adding too much sugar syrup would dominate its taste and hide the satisfaction delivered by the nuts and dough, while being too short on the sugar syrup would deny its sweet feeling and gratification. The thin phyllo dough and the sugar syrup are first prepared. Then Baklava cubes consisting of raw nuts sandwiched between multi-layered phyllo dough are prepared and baked. To make the phyllo dough, flour, water, and a hint of salt are mixed together. Then the dough is cut into small balls, and each ball is kneaded extensively to form a very thin layer of dough. To prepare sugar syrup, generous amounts of sugar are added to water and heated at very high temperature to dissolve the sugar in the water. The mix is brought to a boiling point after which a hint of lemon is added and the resulting sugar syrup is then left to cool. About eleven layers of the paper thin phyllo dough are stacked on top of each other. In order to make sure the stack of layered dough stays very thin, each time a layer is added, the whole stack is kneaded anew. Next, the filling consisting of raw nuts with a hint of sugar is added on top of the dough. Pistachios, walnuts, and cashews are usually used as filling. Afterwards, another stack of eleven layers of thin phyllo dough is prepared and placed on top of the nuts resulting in a thick layer of nuts sandwiched between two layers of dough. Finally, the nuts filled dough is cut into cubes of the desired size. The Baklava cubes are placed on a baking sheet, and hot melted ghee is poured on top. They are then baked for about one hour on medium temperature. After baking, the remaining ghee is drained and sugar syrup is added on top. Mediterranean pastries, besides being great desserts, they also constitute great gifts on many occasions and are ideal corporate and business gifting. Whether you are invited to a lunch or dinner party, or whether you are gathering with friends for a celebration, taking with you an arrangement of Libanais Sweets Baklava is greatly appreciated. This great Mediterranean pastry provides instant gratification and satisfies anybody with a sweet tooth. It is gifted on virtually every occasion. It is a great gift to your teacher on Teacher’s day as well as to a friend as a Thank You gesture. On holidays, all over the world, this sweet treat is becoming the natural gift. In the Middle East, it is hardly possible for a holiday to pass and not to gift or to receive a gift of Mediterranean pastries. Mediterranean pastries are served as dessert. It can be served alone or as part of an assortment of Mediterranean sweets which also includes Borma, Basma, Balourieh, Fingers, and other Mediterranean sweets. Mediterranean pastries have recently gained worldwide popularity, but their stronghold stays in Mediterranean and Middle Eastern countries such as Lebanon, Syria, Jordan, Palestine, and Egypt as well as in Turkey, Serbia, Armenia, Iran, Greece, Pakistan, and the Arabic Gulf region. Among all Mediterranean pastries, it has the most widespread reach and popularity. For more details, read about the history of baklava. It is an authentic Mediterranean pastry and is one of the most famous desserts of the region. In the Middle East, it is considered one of the elements that constitute the assorted Baklava family which comprises many other Middle Eastern pastries.